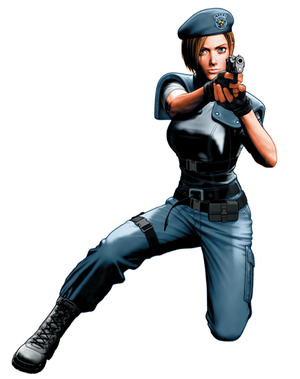 This is the first game in the Resident Evil series. For other games in the series see the Resident Evil category. Resident Evil (called Biohazard in Japan) was one of the first survival horror genre games to be released. The game was released first in Japan on March 22, 1996 for the PlayStation and was met with high success. 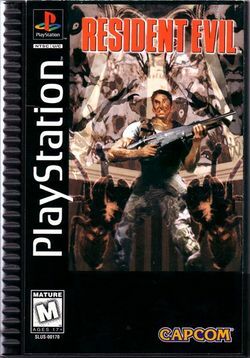 It was then released in North America on March 30, 1996 and was one of the highest selling PlayStation games of all time. It was also remade for the GameCube (called REmake by many fans) and was then ported to the Nintendo DS in 2006 to celebrate the ten year anniversary (which made use of the innovative touchscreen). The original game had amazing three-dimensional graphics (with pre-rendered backgrounds) and a unique camera angle approach that had a control system based upon it. The game forces the player to go through several challenges, whether it is finding an item, solving a puzzle, or fighting an enemy. It also featured two selectable characters and a variety of different paths you can take, with four available endings (depending on which path you took). The title has won numerous awards, and was a vital part of the PlayStation's wide success and popularity. The story is based around a fictional town called Raccoon City. Raccoon City is a small and peaceful town, located in the northwestern region of the United States. The peace was shattered, however, when grisly murders took place in the outskirts of Raccoon City. Victims were attacked in their homes by a group of about ten people, with evidence of cannibalism found. A case like this has never happened in Raccoon City before, so local law enforcement officials sent in S.T.A.R.S. (Special Tactics And Rescue Service) Bravo Team to investigate the area. This page was last edited on 30 May 2016, at 13:44.